Because the multiplier is a development of the original revolving spool centrepin, the spool must revolve to pay out or recover line. When you cast with one, the weight and speed of the sinker as it flies out to sea pulls line off the spool, making it rotate. All distance casting calls for a shock leader. If you use a brightly coloured one, as here, it’s easier to see in dim light. The classic birdsnest. Avoid it with a smooth cast, even line lay and a well set up reel. You can also get one if you’re late thumbing the spool to a stop when the lead hits the water. Cod fishing from steep shingle beaches often calls for big casts – which means a good casting style and a well set up reel. At first the speed of the lead determines how fast the spool rotates. However, wind resistance slows the lead, so if the spool doesn’t slow down as much, more line comes off the spool than the lead needs. This extra line forms loose coils which can then catch on the spool as it rotates. Before you know it the line is winding back on to the spool but this time it’s going on backwards! Instead of the line coming off the spool, the excess line is now being wound back the other way. With your lead flying in one direction, and the line being wound back in the other, the least you can expect is an almighty jerk and a huge tangle. 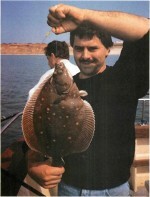 Often your terminal tackle cracks off as well, which can get expensive if you make a habit of it. This can happen with just the plain lead used in tournament casting. Add to that the air resistance of a three hook paternoster and a headwind and you can see how a session of overruns and crack-offs has produced many a committed fixed-spool user. The solution is to slow the rotation of the spool in time with the lead – to brake the spool. That way there’s no excess line. With primitive multipliers, using your thumb to slow the spool’s rotation during the cast was a good way to do this. There’s no need to thumb the spool of a modern multiplier if you set it up properly— the braking is built-in. Overruns are then more easily avoidable, being due to uneven line lay or a jerky cast. Ideally, the spool supplies the sinker with just enough line so that resistance is almost zero. This is hard enough to achieve even under tournament conditions, where your sinker isn’t slowed by bait and traces. When fishing, you can’t expect perfection. The best you can hope for is that while the sinker has to pull line from the reel, it doesn’t have to pull too hard, causing you to lose distance. The simplest form of braking is using the end cap or caps. These are the caps on the side plates of your reel which take up the side-to-side play of the spool as you tighten them. 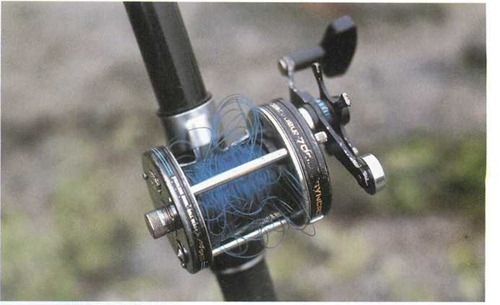 If you take up all this play and then tighten up a touch more, the extra tension acts to slow down the spool. If you rely too heavily on this kind of braking, you can wear holes in your end caps. Another way to vary the braking of your spool is to lubricate the bearings with oils of different thicknesses. You might be surprised at the difference between reels lubricated with 3 in 1 cycle oil and with SAE 90 gear oil. 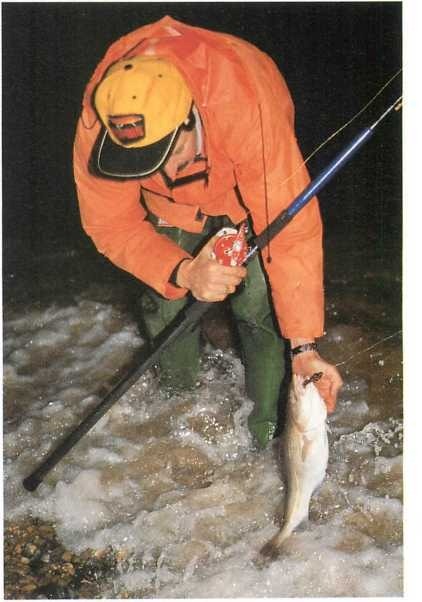 The thin 3 in 1 is fine for tournament casting, whereas the thicker gear oil provides plenty of braking for a beginner. This works for all reels, though ball bearings hold the oil longer than plain bush bearings. Indeed, you may find you have to remove the end caps about every ten casts to re-lubricate bush bearings. The above two methods work well, but for efficient braking and control they are best used on a reel that features built-in brakes. The most common types are centrifugal and magnetic brakes. Centrifugal brakes are very popular and work on a simple principle. Two brake blocks are mounted on a pin which is fixed to the spindle next to the spool. As the spool rotates, the brake blocks are thrown out along the pin and rub against a special drum around the pin – a bit like drum brakes on a car. The friction this causes slows the spool. Removing one of the blocks reduces the braking, as does decreasing the size of the blocks. However, to change the braking you do need to take the spool out. 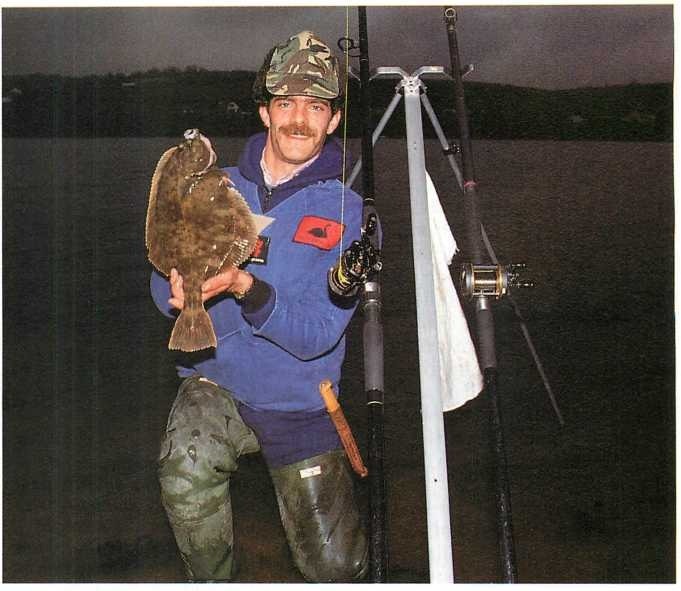 Magnetic brakes are a fairly recent idea, but they don’t seem to have caught the imagination of many shore anglers. Some systems involve a single magnet which attracts the spool and is moved closer to it for more braking. Others involve banks of magnets which attract each other. They have a dial which allows you to change the braking externally. It can be a great help if you want the reel to react to changing conditions such as a headwind getting up, or a change of bait size. The heavier the spool, the more momentum it has when it starts rotating, and so the harder it is to slow it. This is why multipliers designed for distance casting have light graphite or alloy spools. Similarly, narrow spools are better than wide ones and since line itself has weight, a fuller spool means more overruns. Small multipliers with light spools are the easiest to control and give the best distances. For general open beach work with lines of 0.35-0.40mm diameter (15-18lb/6.8-8.2kg b.s. ), small baitcasting reels such as the ABU 6500 series or the Daiwa 6HM and 7HT are ideal. Some situations call for ruggedness and winching power instead of very long casts. For mixed ground fishing, where you’re using lines of 0.40-0.45mm (18-25lb/8.2-11.3kg b.s. ), the ABU 7000, Daiwa SL and the Shimano Speedmaster IICFS are powerful but are still capable casting reels. For really rough ground fishing where casting potential is unimportant but where robustness is vital, powerful reels like the ABU 9000 and 10000, the Daiwa Sealine and the Shimano Speedmaster III are the best choices. They have the strength to allow you to wind heavy lines on to the spool under enormous pressure without breaking. Whatever multiplier you use, set the braking to suit your abilities. It’s no fun constantly losing terminal tackle and line. 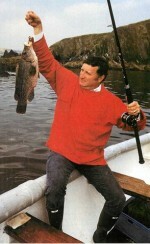 A tournament caster may be prepared to risk the odd crack-off for an extra yard or two. But if you are always worrying about cracking-off, you won’t be able to concentrate on improving your technique.